The radio business founded in 1946 by Gustav Guth in Salach, in the German state of Baden-Württemberg, soon became involved in developing and manufacturing high voltage equipment for research laboratories and industrial uses. Constant growth, the result of extension of the range of applications and the continuous development of new products, lead to the firm moving to a new location in Salach in 1984, Spitzenbergstrasse 6. In 2001, the manufacturing capacity was increased by a new building with an additional 800 m2 of floor space. Today, we and our 25 members of staff work to find solutions to complex, customer-specific problems in the field of high-voltage technology. Our strength is our customer focus. From the initial idea via the planning stage through to implementation, we assist our customers in partnership with help and advice. We recommend the appropriate high voltage equipment or components and discuss their variants and accuracy requirements. 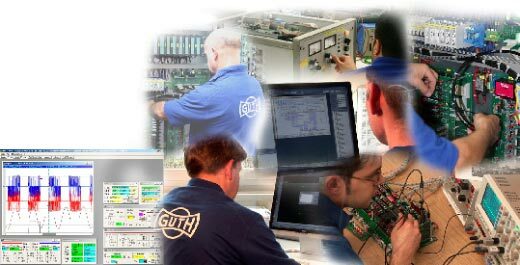 The systems are designed and produced according to the specific requirements and applications of our clients. Our engineers and designers design and develop according to customer specifications control systems, circuits, and the appropriate equipment layout. Here will be used modern CAD systems for PCB layouts, schematics and mechanical components. All printed circuit boards and controls go through a 100% function check before they are installed. Highly-skilled professionals with years of experience in instrument building take the manual assembly. Prior to delivery we perform extensive testing of all equipment, with simulation and trial of all applications and all operating conditions to ensure the viability of any system. Our customers benefit from our commitment to quality assurance system according to DIN EN ISO 9001:2000. Device documentation and testing protocols are also in subsequent technical amendments kept up to date for each individual client device. Our customers appreciate our solutions to difficult tasks, our punctuality and the quality of our work. For our customers we are prepared for worldwide service operations.